Joel Embiid tries to fend off the Hawks' Taurean Prince during the Sixers loss in Atlanta on Saturday. ORLANDO – The 76ers should be energized heading into Monday night’s game against the Orlando Magic. The contest at the Amway Center will be 47 hours, 30 minutes after the embarrassment of being outhustled, the sting of costly turnovers, and the pain of losing another game to the rebuilding Atlanta Hawks. The Hawks (26-48) were able to get any shot they wanted – three-pointers, floaters, mid-range jumpers, dunks, layups – in their second straight win against the Sixers (47-26). Jimmy Butler was asked if his team’s lackluster performance had to do with energy or communication. He believes the Eastern Conference’s third-best team didn’t think it would fall into that trap. After all, they headed into Atlanta with a six-game winning streak, which included an emotional victory over the Boston Celtics three nights before. The streak also included a road win over the Milwaukee Bucks, the NBA’s best team, on March 17. The Sixers’ goal is to reach the NBA Finals. Anything less than reaching at least the conference finals, assuming the squad remains healthy, would be a disappointment. Their first step would to be hold onto the conference’s third seed for the postseason. The top four squads in the Eastern and Western conferences get home-court advantage in the first round of the playoffs. Obtaining the third seed would enable them to avoid a tough No. 4/No. 5 first-round matchup against the fifth-place Celtics. 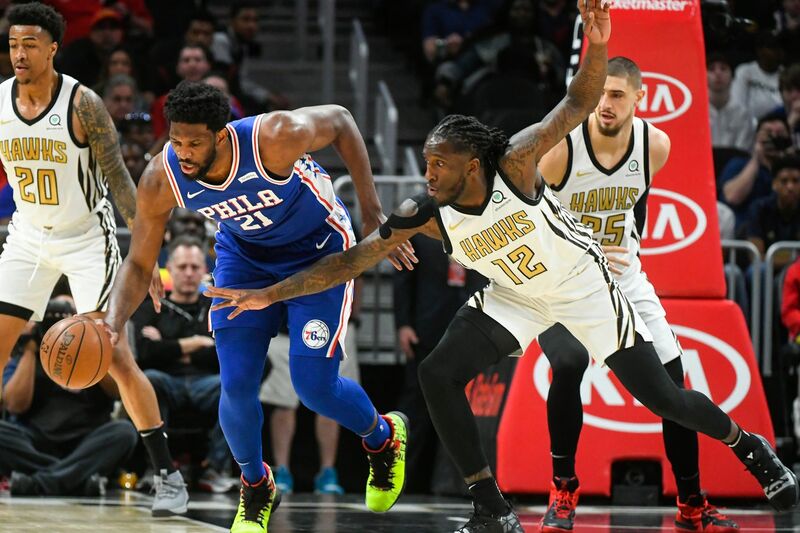 Heading into Sunday’s NBA action, the Sixers were three games ahead of the fourth-place Indiana Pacers and four games ahead of the Celtics with nine games left. The Pacers took a 44-29 record into Sunday night’s home contest against the West-leading Denver Nuggets (49-22). Boston (43-30) entertained the San Antonio Spurs on Sunday. The Sixers control their own destiny and have the easiest remaining schedule of the three squads. They just need to play with more focus and energy no matter the opponent, beginning Monday night. The Magic (35-38) are still in contention for a playoff spot, being a game behind the eighth-place Miami Heat. The Sixers have beaten Orlando in two of the three games the teams have played. Their one loss was 111-106 on Nov. 14 at the Amway Center in Butler’s Sixer debut. This time around, Orlando comes into the contest with a four-game winning streak. So the Sixers are aware that duplicating Saturday’s performance could definitely lead to another loss. In addition to defensive woes, Philly was doomed by turnovers, especially late in the game. They committed seven of their 14 giveaways in the fourth quarter. The final three were costly. Joel Embiid turned the ball over on consecutive possessions. He lost the ball with 1 minute, 40 seconds remaining. And there was a bad pass 13 seconds later. With the score tied at 127, Butler, who overdribbled while looking for a game-winning shot, helped force a shot-clock violation with 3.5 seconds left. James Ennis III passed him the ball as time was running out. But the coach couldn’t over the Hawks’ playing solid basketball.